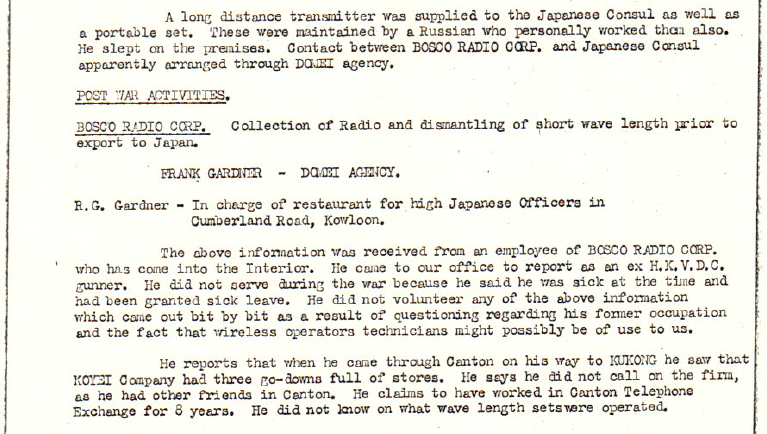 Can you provide more information about Bosco Radio Corp., the Gardner brothers or “Kyoei” company, the latter particularly pre-WW2 and during? Elizabeth Ride has sent this BAAG report. She notes: the page you originally posted [ie up to Post War Activities] was one of two of a document of which the second page was ‘restricted’ (withheld) in the BAAG papers by the MOD until the year 2021. However, I later found the following whole document, (shown below), in the Foreign Office files in the National Archives. Kukong Intelligence Summary #1, 28.5.1942. Brian Edgar: The Gardner brothers left for Macao in November 1942 (1 p362). They were suspected of helping the Japanese with radio equipment and were allowed to take far more to Macao than the regulations stipulated. The BAAG seems to have confused the Gardner brothers with Archibald Gardner, who was as far as I know unrelated. He gave evidence at a War Crimes Trial. This article was originally published on 23rd August 2014. Thanks for posting this – had the Gardners actually assembled the radios in HK they would have been the pioneers of HK radio industry instead of H.C. Woo of Atlas Electronics/Champagne in the 1950s. In any case, I believe Frank Gardner of Bosco Radio is the same individual as Frank Gardner the HK toy industry pioneer profiled in the book “Toy Town” written by Sarah Monks and published by HK Toys Manufacturers Association in 2010.The story as told by Frank’s daughter Angela in the book differs from the BAAG accounts – it said Frank was born in HK instead of Japan in 1920, although he did spent his childhood in Japan where his father was the Bolivian ambassador to Japan. 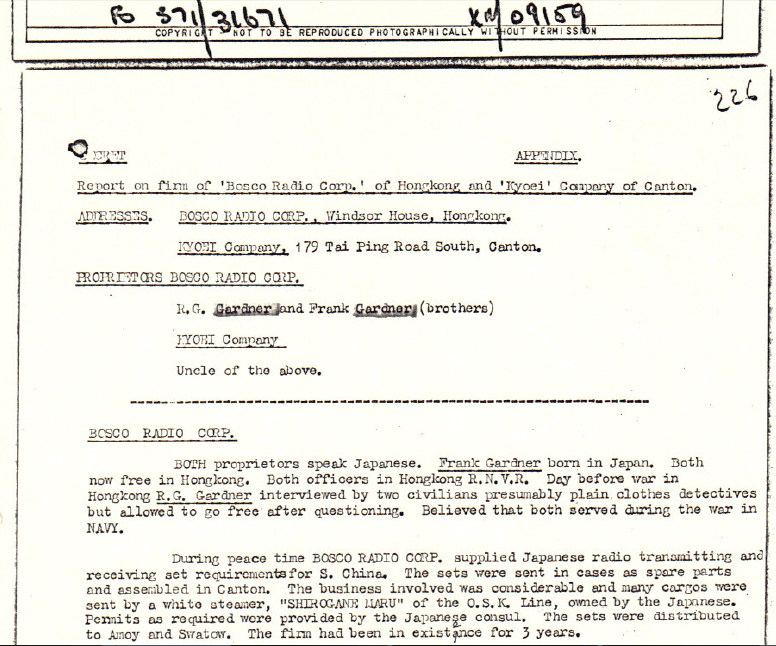 (it is unclear what nationality the Gardners identify as – the book mentioned they are of European descent but have been in Asia since the 1840s with some Spanish and Macau Portugese blood mixed in) It also mentioned that Frank did not join his brother Bobby (presumably the RG Gardner in the BAAG report) at Bosco Radio until after the war while this BAAG report clearly shows that he was involved since Bosco’s inception in 1939. Anyhow, Frank’s greater contributions was in the toy industry where his firm PMC was one of the first HK firms to participate in the Nuremberg Toy Fair but sadly his business failed in the 1970s and he died of a heart attach in 1982 at the age of 61.